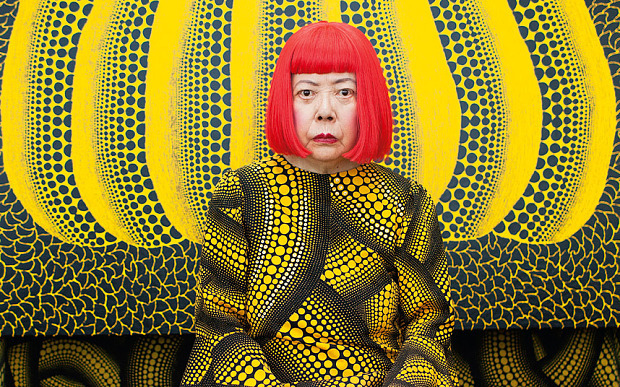 If you're unaware of Japanese artist Yayoi Kusama, you may have been living under a rock for the last 50 years - or perhaps your artist awakening took place during a very few specific years when her practice had quieted down quite a bit (or maybe you're just not a particular fan of polka dots and you've repressed everything about them). She's the venerable queen of all things spotted, and has had an impressively long career, as we explored in an Artist Spotlight piece on her quite a while ago. As her visibility ramps back up again, she's currently working in a partnership with the (in)famous disruptive hotel startup Airbnb and the Tate Modern Britain. For those of you unaware of it, Airbnb is a startup company that allows average people to rent out their spare rooms or spare homes/cottages using their website. It's totally shaken up the hotel industry and inspired a number of people to leverage the new system in brand new ways. Of course, part of that means that there is a great deal of competition in the more popular areas of the world, including London, Paris and New York. Needless to say, it's always nice to have an edge over the competition, whether it's better amenities for your guests or proximity to popular locales, but there are few things that can top having your rental rooms decorated by a famous artist. That's exactly what the partnership is putting together, and the decisions are going to made via a lottery-type contest conducted by the Tate Modern Britain. Unfortunately for all those of you just reading about it now the contest closed on May 10th, 2016, but it will still be fascinating to see the results of her work (not to mention how much the lucky winner decides to charge for sleeping inside a work of art). It turns the whole notion of a 'boutique hotel' on its head, considering the fact that some of Kusama's work has sold at auction for millions of dollars US. If you're living in London, expect to see an especially incredible listing popping up somewhere on Airbnb in the next few months, although there is no word on when the project is due to be completed.